Are you always losing your lighter? Ever been a victim of a lighter thief? Are you a bartender who always needs to have a lighter handy for customers? 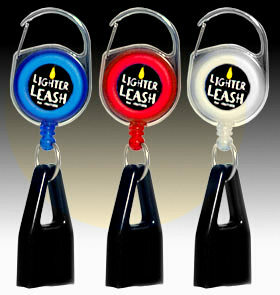 Well worry no more because the lighter leash is here. The lighter leash comes with a strong 32 inch nylon retractable cord, holds a standard Bic lighter or similar sized disposable lighter (like Clipper® and Winlite®), and clips securely to ones belt, pocket, skirt, or purse to give its user quick access to a light. Lighter sold separately. I love them and so do my friends. So handy to clip on a visor, or take on a boat or just clip on your cig case or even just cigs that come in a box. I will be back to order more. THEY ARE GREAT and a good value.